The Kalipunan ng mga Kristyanong Kabataan sa Pilipinas (KKKP), an aggrupation of ecumenical young people from the ranks of Protestant and non-Roman Catholic churches joins the Filipino people especially the youth in calling for the resumption of the formal peace talks between the Government of the Philippines (GRP) and the National Democratic Front of the Philippines (NDFP) over its recent termination as declared by President Rodrigo Duterte last February 4, 2017. Since Pres. Duterte assumed office and announced his commitment to pursue talks with the NDFP after years of impasse, we, the ecumenical youth had been very hopeful. We started aspiring that social problems such as poverty and joblessness will be dealt with, and finally resolving the roots of armed conflict in the Philippines will be made possible. We commended both Parties for achieving several gains since they resumed and sat down at the negotiating table. There has been outstanding gains that has been triumphantly succeeded. We saw glimmer of hope when both parties affirmed the signing of the Comprehensive Agreement on Human Rights and International Humanitarian Law (CAHRIHL) and under it, the reviving and strengthening of the supplemental guidelines for the Joint Monitoring Committee to cite a few. On the other hand, the negotiations on Comprehensive Agreement on Socio and Economic Reforms (CASER) that serves as the basis for economic development here in the Philippines also started. Such gains brighten the path towards genuine peace that will benefit the whole nation. These had been the victories of the several rounds of talks that promisingly lead to the path of peace. We celebrated in these gains and believe that the young people will benefit most from the agreements especially on national industrialization and job creation in the country. At last, through these developments, we can maximize our full potential as youth of the nation and to contribute to nation building. The socio-economic reforms that will be conceived from the talks will bring land for the farmers, decent jobs for us who will soon graduate from schools, and national industrialization that will bring genuine development for the country. A bright opportunity to bring genuine development of people is already at our foresight. We had been hoping that peace will be achieved in our generation today, making us more productive forces few years from now. 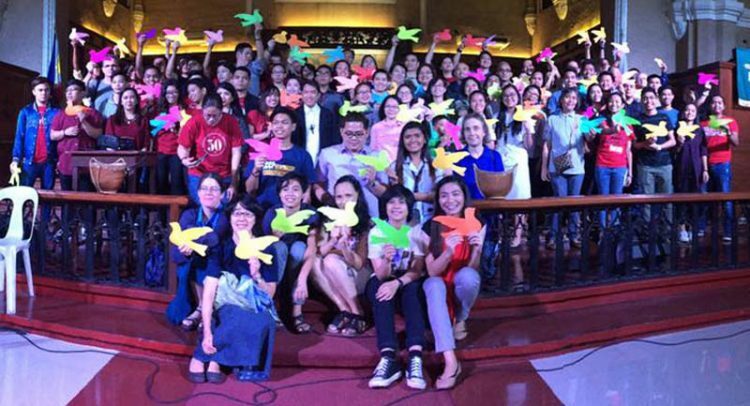 The Ecumenical Youth is committed to Peace. Even though we know that the road to peace is studded with sharp twists and turns, our commitment to fulfill peace that is based on justice will never falter. Our call for the GRP and the NDFP to go back to the negotiating table is a prophetic stance that we must hold on to as young people. For this ensures the future of this nation, and therefore the future of our youth. As the Ecumenical youth, we call on Pres. Duterte to continue on its promise for meaningful change. We call on the resumption of the Peace Talks between the GRP and the NDFP for it would mean promising and bright future for the youth of this nation.